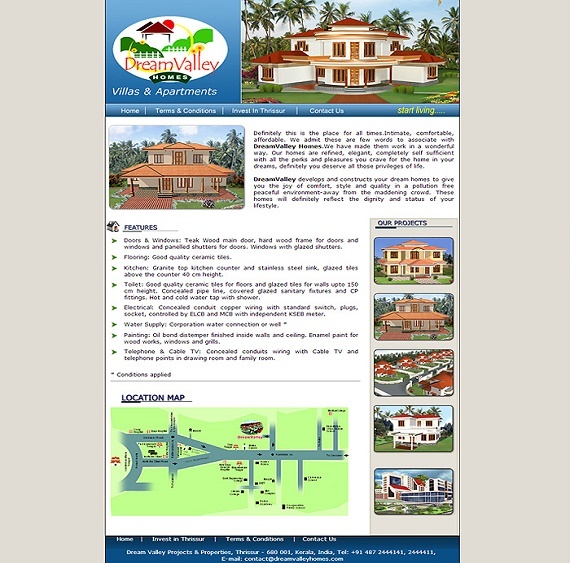 Parappilly Builders, the number one constructors in Thrissur town have a rich legacy to boast of. 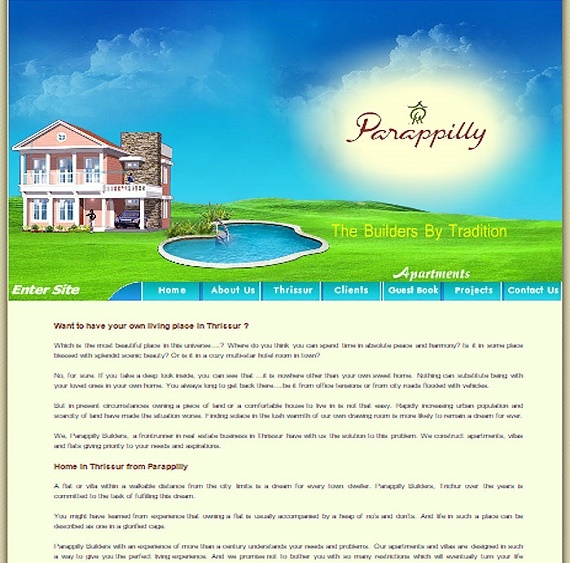 Parappilly family, promoters of Parappilly Builders, is one of the important Christian families in Thrissur. Sakthan Thampuran (Maharajah of Cochin)’s decision to shift his residence to Thrissur was a landmark in the history of this town. He envisioned a modern Thrissur and brought many Syrian Christian families to start trade and business. Parappilly family, hailing from Arimbur was specially given the task of shaping the modern Trichur. Antony Parappilly was the mastermind in this great endeavour. Definitely this is the place for all times.Intimate, comfortable, affordable. 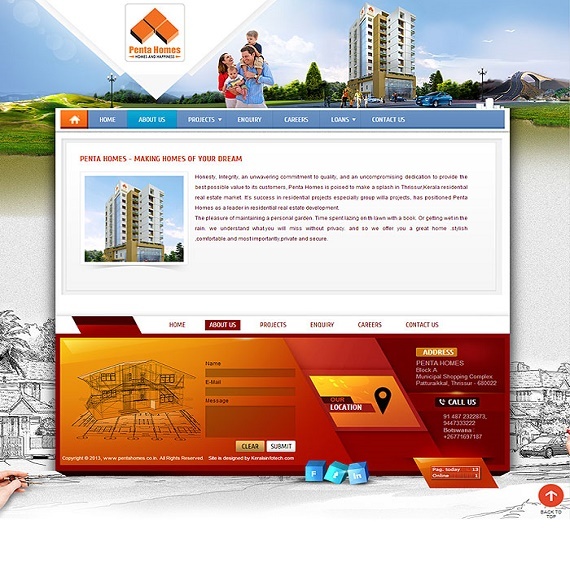 We admit these are few words to associate with DreamValley Homes.We have made them work in a wonderful way. Our homes are refined, elegant, completely self sufficient with all the perks and pleasures you crave for the home in your dreams, definitely you deserve all those privileges of life. DreamValley develops and constructs your dream homes to give you the joy of comfort, style and quality in a pollution free peaceful environment-away from the maddening crowd. These homes will definitely reflect the dignity and status of your lifestyle. 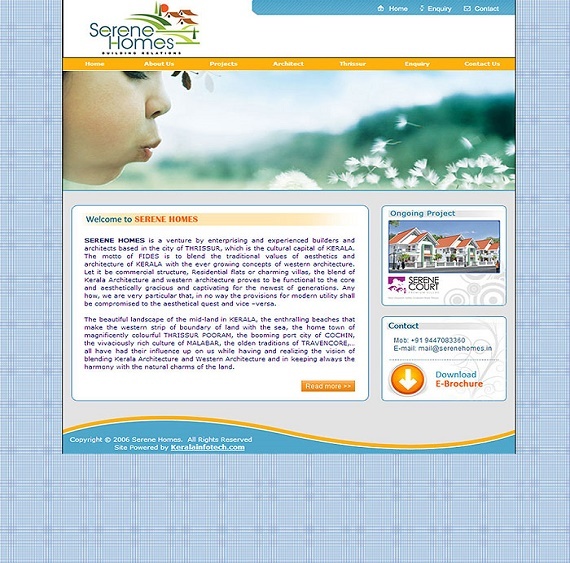 SERENE HOMES is a venture by enterprising and experienced builders and architects based in the city of THRISSUR, which is the cultural capital of KERALA. The motto of FIDES is to blend the traditional values of aesthetics and architecture of KERALA with the ever growing concepts of western architecture. Let it be commercial structure, Residential flats or charming villas, the blend of Kerala Architecture and western architecture proves to be functional to the core and aesthetically gracious and captivating for the newest of generations. Any how, we are very particular that, in no way the provisions for modern utility shall be compromised to the aesthetical quest and vice –versa. The beautiful landscape of the mid-land in KERALA, the enthralling beaches that make the western strip of boundary of land with the sea, the home town of magnificently colourful THRISSUR POORAM, the booming port city of COCHIN, the vivaciously rich culture of MALABAR, the olden traditions of TRAVENCORE,…all have had their influence up on us while having and realizing the vision of blending Kerala Architecture and Western Architecture and in keeping always the harmony with the natural charms of the land. "TEKTON" ("A Greek term for Carpenter, Wood worker or Builder") is the brainchild of Mr. Binoj, having years of all-round experience in the field of real estate development. 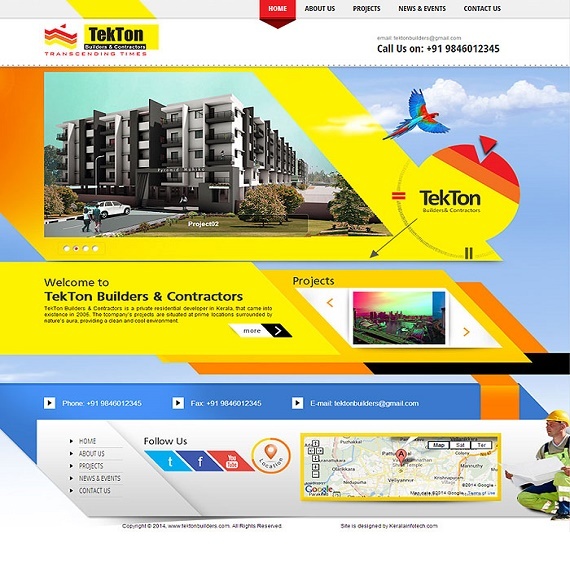 TEKTON Builders and Contractors is a company nurturing the vision to provide holistic solutions in land and property investments, development and management, with different exciting concepts that cater to the requirements of people belonging to various layers of the society, with the founders’ long standing business acumen in construction and property development.The brand is very keen in choosing the location, implementing cutting-edge technology and novelty in engineering application which helps TEKTON in etching its signature in realty sector of Kerala. Since its inception in 1998, TEKTON has believed that there is only one mantra for success: Quality. This combined with uncompromising values, customer-centricity, robust engineering, and transparency in business operations, has placed it among the ‘most preferred’ real estate brands in both residential and commercial segments. The Company has grown from strength to strength, having successfully completed several projects in short span. Alukkas Builders and Developers Private Limited is a prestigious venture from the House of Alukkas, the trusted name in jewellery business since decades. The superior quality standards enjoyed by our valued customers continues here as well with each projects tailor made to suit your dreams and likes of what a perfect dwelling abode should be. Compromise is not in our dictionary and their chances for complaints even years after the sale are negligible. The projects range from luxury apartments to the ones which suits a commoner who dreams to own a piece of land in the cultural capital of God’s own Country. The team of architects behind the projects of Alukkas Builders and Developers Private Limited are rated the best among the industry. They spend hours brainstorming on making every project Sale smooth from choosing the land to creating designs that suits the natural habitat of the location. The craftsmen chosen for working in each and every area of construction are those who having years of experience in the area and knows the intricacies of the job well and are able to blend a judicious mix of tradition and modernity. 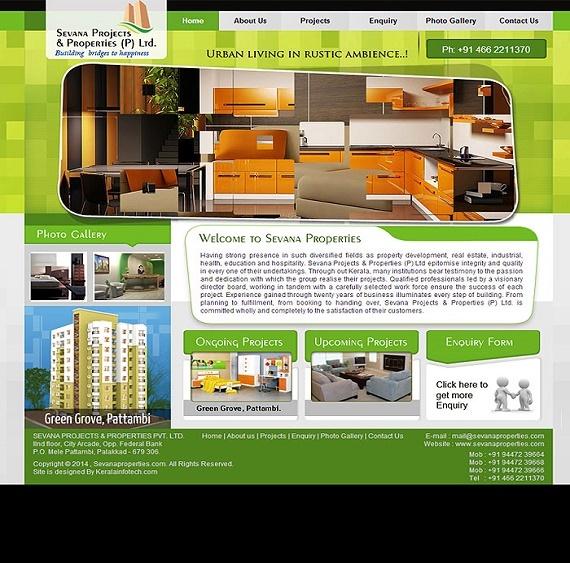 Sevana Projects and Properties (P) Ltd. Is led by entrepreneurs possessing experience and expertise gained through long years of running businesses in Kerala and Middle East. 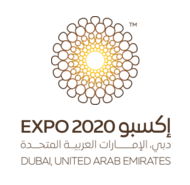 Inspired by traditional values and keen sense of business, their unceasing focus and insistence on quality ensure every projects successful realization. Their leadership motivate whole of us to perform better and better. Honesty, Integrity, an unwavering commitment to quality, and an uncompromising dedication to provide the best possible value to its customers, Penta Homes is poised to make a splash in Thrissur,Kerala residential real estate market. It’s success in residential projects especially group willa projects, has positioned Penta Homes as a leader in residential real estate development. The pleasure of maintaining a personal garden. Time spent lazing on th lawn with a book. Or getting wet in the rain. we understand what.you will miss without privacy. and so we offer you a great home .stylish ,comfortable.and most importantly,private and secure. Built on a legacy of over Twenty four years of honoured commitments, integrity, innovation and "TIMELY DELIVERY" of quality Real Estate, "NAKSHATRA BUILDERS&DEVELOPERS" is a name that exudes trust. 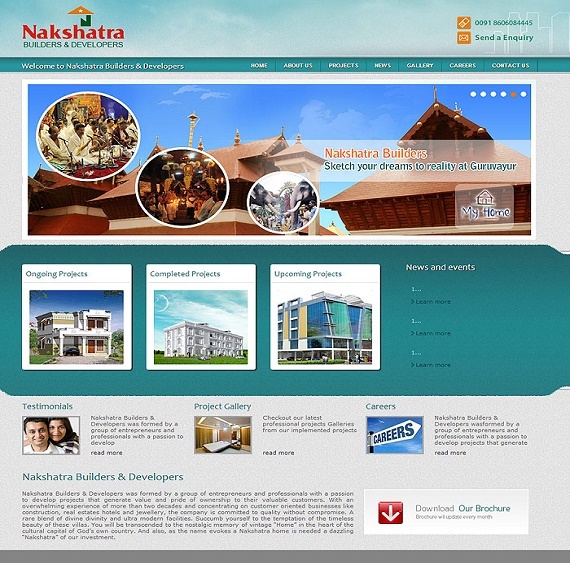 We are a well reputed and most sought after business group in the Real Estate & Hospitality sector and belong to the temple city of Lord Krishna, Guruvayur. 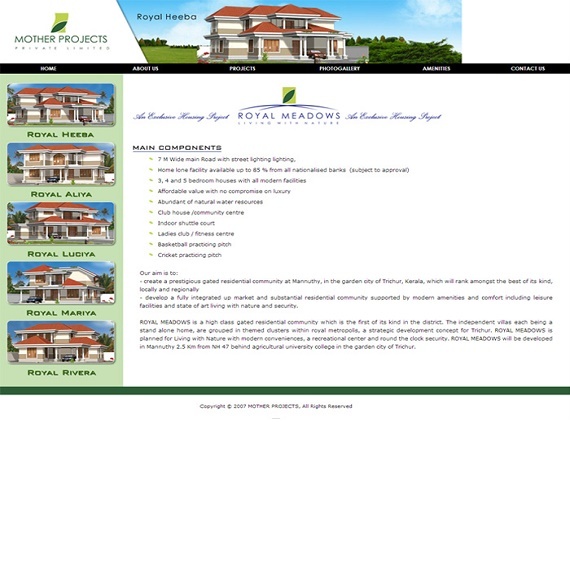 EXPERIENCE in this field has metamorphosed us into a reliable builder in the REAL ESTATE SECTOR. All our TEN FINISHED PROJECTS stand as a testimony to our basic approach towards constructing classic REAL ESTATE. We are currently executing projects to the tune of over TWO LAKH SQFT with plans to expand to various locations within and out side Kerala state. We have set the pace for excellence in AFFORDABLE HOME BUILDING garnering praise for an efficient business model that saves buyers‘money. Royal Meadows is a high class gated residential community which is the first of its kind in the district. The independent villas each being a stand-alone home, are grouped in themed clusters within royal metropolis, a strategic development concept for Thrissur. Royal Meadows is planned for Living with Nature with modern conveniences, a recreational center and round the clock security. The project will be developed in Mannuthy 3.5 Km from NH 47 behind agricultural university college in the garden city of Thrissur. The project consists of 60 villas out of which 17 have been completed and sold to privileged clients. There are plots measuring 8 cents, 10 cents, 12 cents and 16 cents. The earlier plan was to construct unique villages of various dimensions as per the size of the plot. With regard to the modern day trend, Mother projects have decide to sell the plots to the clients or construct villas according to the needs and chosen designs of the clients. 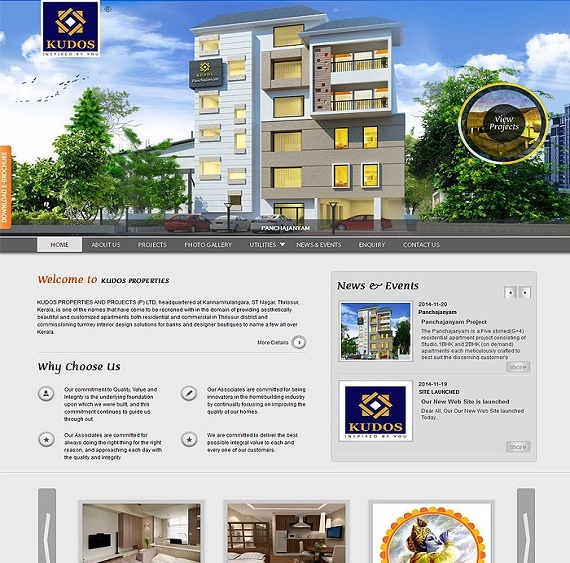 KUDOS PROPERTIES AND PROJECTS (P) LTD, headquartered at Kannamkulangara, ST Nagar, Thrissur, Kerala, is one of the names that have come to be reckoned with in the domain of providing aesthetically beautiful and customized apartments both residential and commercial in Thrissur district and commissioning turnkey interior design solutions for banks and designer boutiques to name a few all over Kerala. We are happy that we have been able to touch the hearts of our customers by being able to deliver these projects exceeding their expectations to their delight. Our past projects, Kudos Towers in Chalakudy and Hill View Apartments in Mannuthy, Thrissur stand testimony to this. Kudos group now takes immense pleasure and pride in foraying into its new residential project “Panchajanyam” at West Nada Guruvayur. Conceived and conceptualized by its CEO, K.N.Balaraman, a businessman of repute and long standing at Thrissur in 2005. 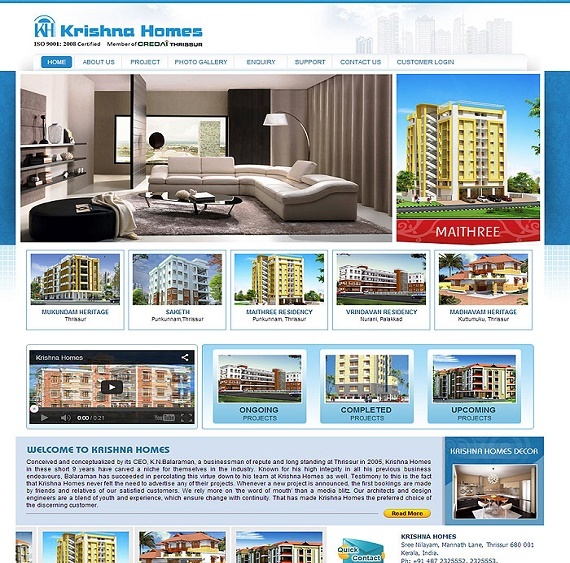 Krishna Homes is well established as one of the most trusted and reputed names in the industry. Known for his high integrity in all his previous business endeavors, Balaraman has succeeded in percolating this virtue down to his team at Krishna Homes as well. Testimony to this is the fact that Krishna Homes never felt the need to advertise any of their projects. 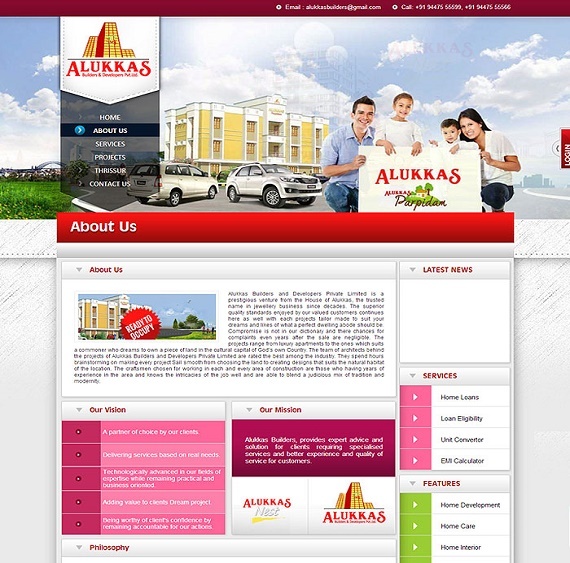 Whenever a new project is announced, the first Booking is made by friends and relatives of our satisfied customers. We rely more on 'the word of mouth' than a media blitz. An Aesthetic Apartment in Prime Residential Area at affordable cost is the dream of every person. We are proud that we have made this dream a reality for many. 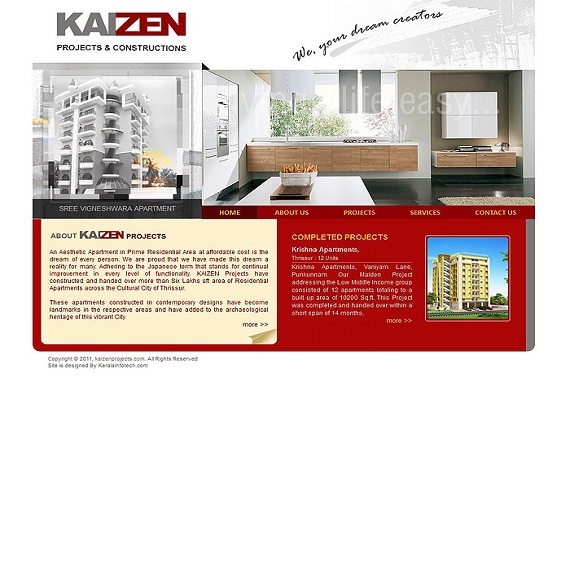 Adhering to the Japanese term that stands for continual improvement in every level of functionality, KAIZEN Projects have constructed and handed over more than Six Lakhs square feet area of Residential Apartments across the Cultural City of Kerala -Thrissur. These apartments constructed in contemporary designs have become landmarks in the respective areas and have added to the archaeological heritage of this vibrant City. As designers, Engineers, Developers & Builders with an enviable and scintillating track records of 20 eventful and rewarding years, our matchless perfection in making homes of your dream, encourage us to reach you with an excellent range of luxury villas. Knowing your taste and likes, when you think about a haven where you wish to be, leads us to create homes that perfectly complement you. The firm believes in total solutions and undertakes everything bound building. 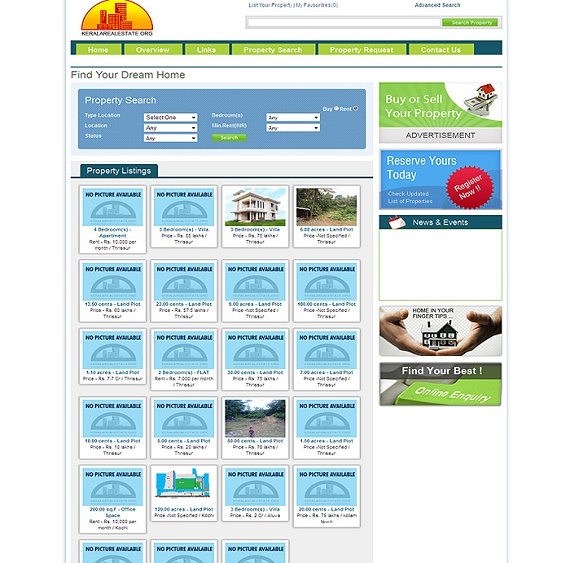 We, at FORMS commit ourselves to give each one of our valued customers their money's worth. This firm commitment, earned from sheer hard work, aesthetic refinement and an uncompromising integrity in the use of high quality material adhering to time frame agreed upon is the proven formula of our reputation.